Don’t want to spend new parts price on an older or high mile vehicle? Rollins Auto Wrecking, Inc might have just what the mechanic ordered for your wrecked or broken down vehicle. 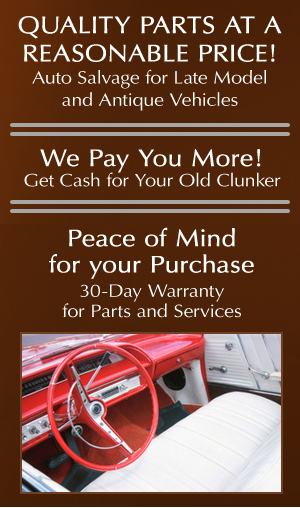 We carry a huge selection of used auto parts for late model and older cars, trucks and vans. All of the parts we sell are backed by a 30-DAY WARRANTY. Not bad considering the price is right, and we are a salvage yard. For the most affordable and widest selection of used parts, call Rollins Auto Wrecking, Inc at 253-846-9393 or come see us 6 days a week.